6. 24/2/2016 Trampers. 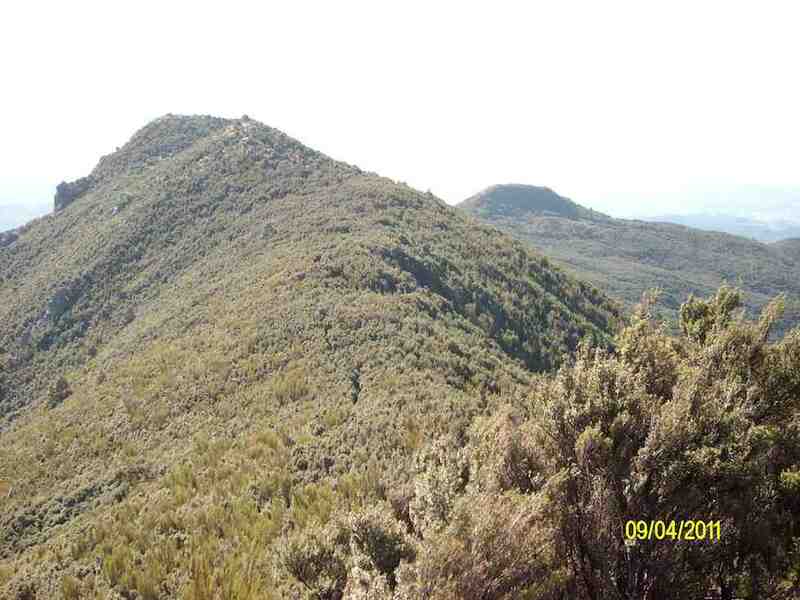 Rosella Ridge. Leaders: Heb and Arthur. Ken. Seven regulars, & one visitor ventured out for this tramp. As we had a key for the locked gate on Mountain Rd. we decided to leave one vehicle at the top of Walker Rd. 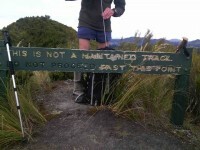 & the other one at the start of Green Hut track. So Arthur took some of the party into the first part of the tramp while the car shuttle was taking place, & the rest of us were left to catch up a bit later on in the morning. 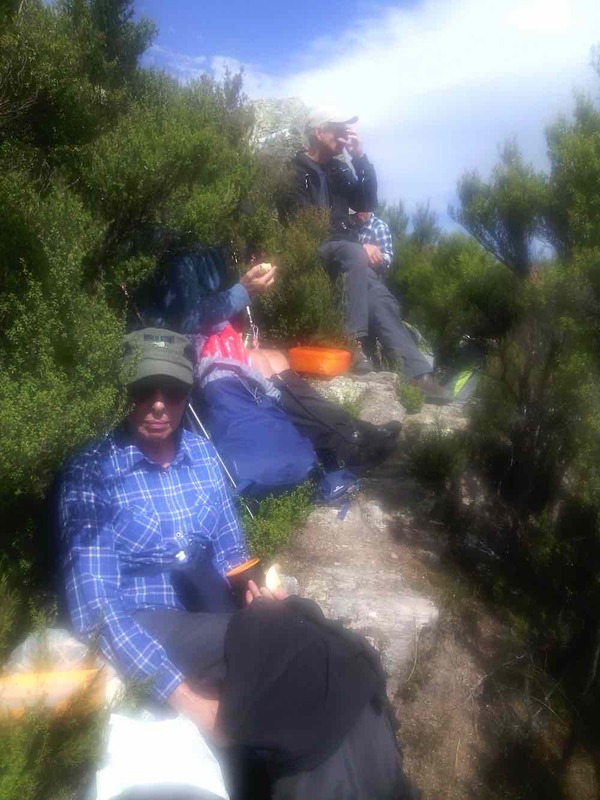 The 2nd group had morning tea at the Sleepy Hollow junction, & then carried on up to the Green Hut site, where we dropped our packs, & headed off to find the water supply that Ian told us was down the hill a bit. Even although there had been no rain for some time, there was a pool of water there, with quite a few drips running into it at all times, so handy to know that water is available from this source if needed. we ventured off along this track to have lunch at the normal spot on the large rock beside the track. 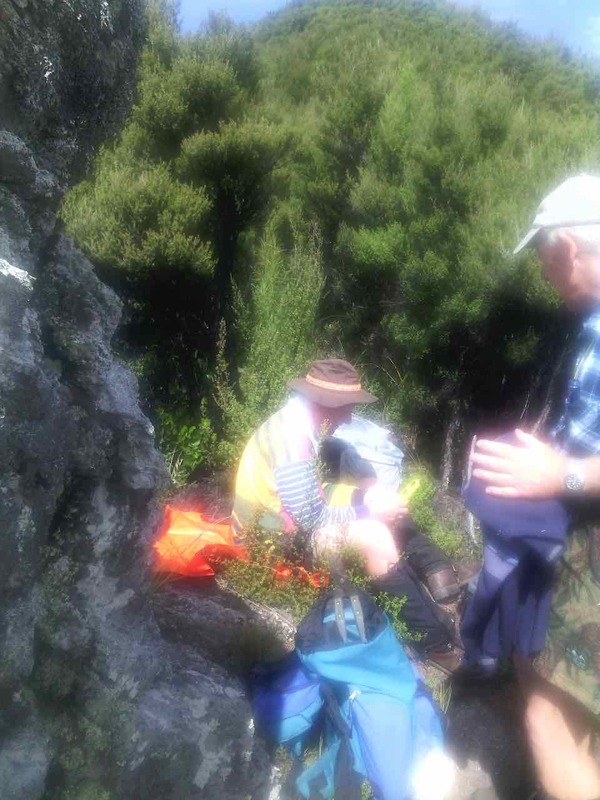 After lunch, we made our way down to where the side track drops off into the Waikouaiti River valley, where we had another rest stop, before moving off down towards the toe of Rosella Ridge. 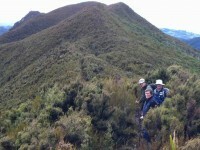 We only got down this track a short distance before we lost the track due to overgrowing bush. So after a look around for the correct way down we decided to retrace our steps to the side track, & go up to Mountain Rd. this way, which required a lengthy road walk to get to the cars, as this exit onto Mountain Rd. is somewhere about the middle of where the the two cars were sitting. After a long hot day a couple of members were feeling a bit exhausted, so two of us climbed to the road, & armed with vehicle keys, walked to the vehicles, & drove them back to the top of the track, where we got everybody safely loaded up, & headed back to town. Today was a day when lots of water & rest stops were required, as it was overcast, but hot for much of the time, with the sun coming out later in the day, & this tramp is quite strenuous with lots of climbing. Our visitor on the day, suffered a few slips & falls, mainly due to the slippery dead tussock lying on the track, but was happily unhurt. With all the hold ups, we arrived home after 5pm, so it was good that we had an early start of 8:30am. The main group walked 12.7km, & the two who retrieved the cars walked about another 1 -2 km. max elev. 696m – Ken. 5. 28/1/2015. Trampers. 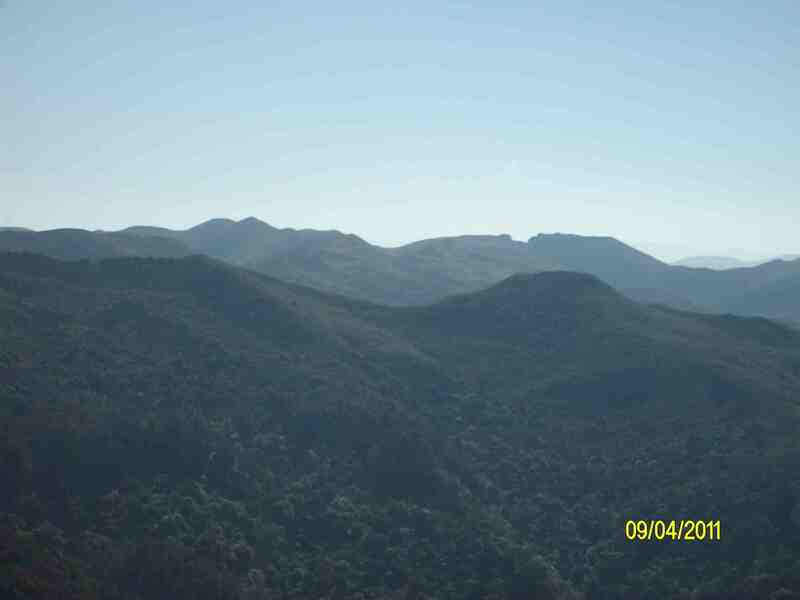 Rosella Ridge. GPS of route, courtesy Ken. 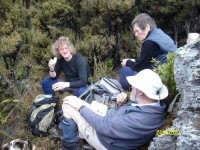 We walked 13.7km; Ave speed 3.2km/h; Moving time 4h 18mins; Climbed 857mtrs; Max Elevation 690mtrs. Top left sharp turn on GPS map is the turn onto Rosella Ridge, which is just below Pulpit Rock. The loop track at the far top right, is the original track that I wanted to do, which is down to the toe of Rosella Ridge, & up the firebreak onto Walkers Rd. As you can see by this picture, the way we went today is quite a bit shorter, but just as challenging. Ignore the straight line in the picture, it means nothing !! On a day when the weather looked decidedly dicey, 6 hardy trampers [4 from the club, & two visitors] turned up for the tramp to Rosella Ridge in the Silverpeaks. As we travelled over the “motorway” we could see that the tops were almost clear at that time, so we thought maybe a good day was in store. As it turned out, the weather was really quite good, & the track surface was dry. it has started to drizzle very lightly, prompting most to don wet weather jackets. 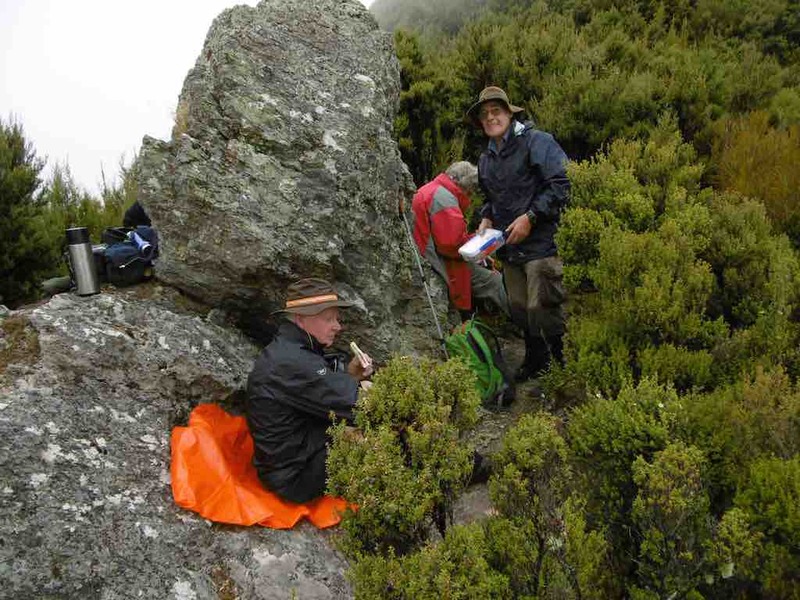 The drizzle didn’t last long, but most chose to keep their jackets on as we made our way up towards Pulpit Rock, & along the first part of Rosella Ridge to our lunch stop by the big rock beside the track. After lunch we made our way along Rosella Ridge to the junction where the track drops off the side of the ridge [Hunters Track, from Hamels book]. The original idea for this tramp was to go all the way to the toe of the ridge, & up the fire break onto Walkers Rd.but with dicey weather, & one or two of the party members wanting to not be late back, I decided to shorten the tramp a bit by going this way. 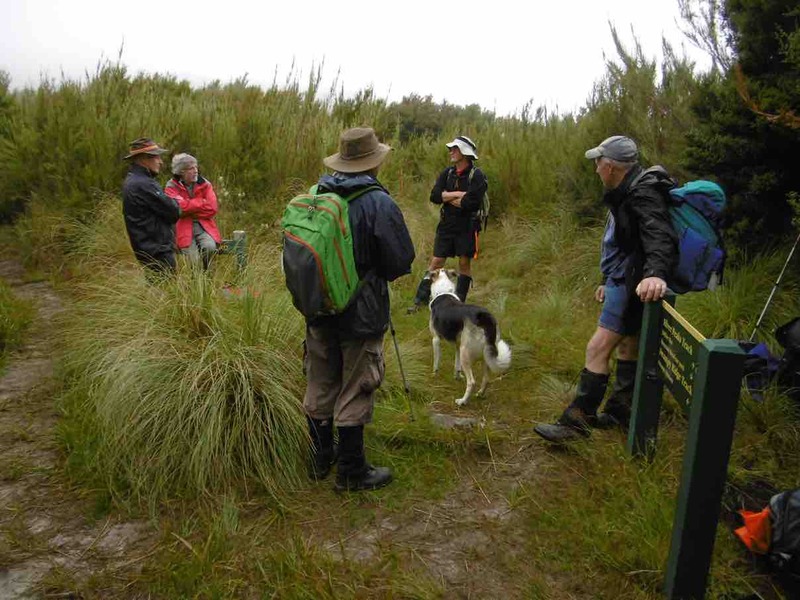 After we reached the bottom of the quite steep drop into the Waikouaiti River, we were faced with a flat area of shoulder high swamp grass with no sign of a track to follow, so we just ploughed our way through this heading to the end of the ridge on the other side where I knew the the track leading up through the pines to Mountain Rd. started. 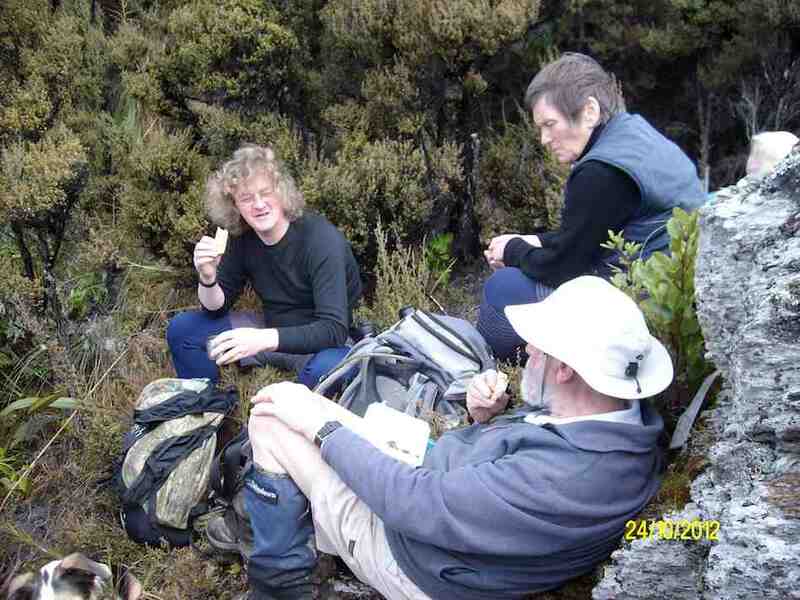 When we found the track, we had a short break to have a drink, discard some clothing in preparation for the climb ahead, & get ‘mentally prepared’ for a lengthy climb out. The top of this track was still holding stagnant water, & the grass was quite long which meant carefull walking to avoid slipping off the high points into the ruts holding water. Six tired & I hope happy trampers arrived back at the cars, & all agreed it had been a good day, with one of our visitors wondering why his new found muscles were starting to stiffen up so much. – Ken. 4. 22/1/2013. Ken & Dermot. 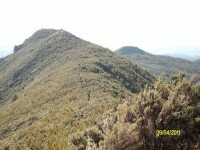 Rosella Ridge to toe and Walkers Road. 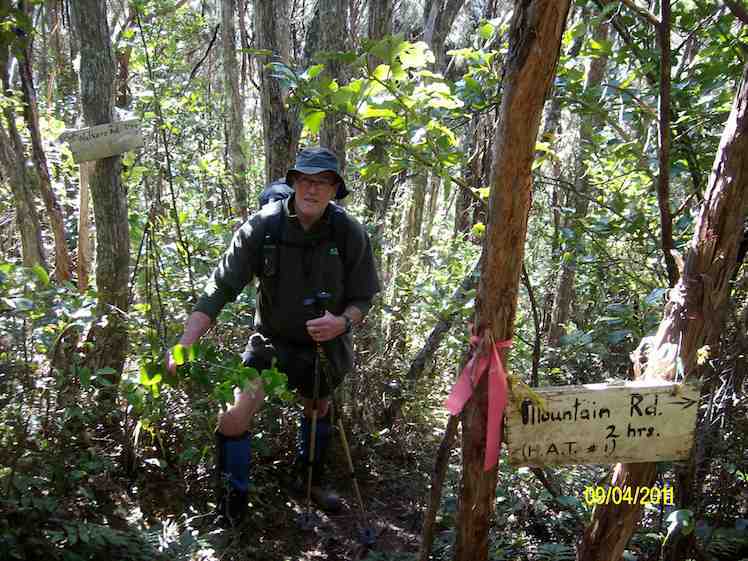 Rosella Ridge to toe and Walkers Road. GPS of route. – Ken. 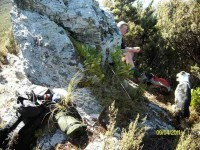 Dermot & I went all the way down Rosella Ridge today, & then up Walkers Road. Walkers Rd [actually the firebreak track before Walkers Rd.] is just SSOOOoooooo steep & a real killer of a climb. 3. 24/10/2012. Mountain Road, Green Hill. 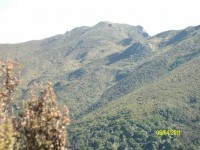 Rosella Ridge, Waikouaiti River, Mountain Road. [Note, added, from Ken on 8/11: We wont get bushed on Rosella ridge again. Dermot Heb & I went up there today, found the correct way through that overgrown bit, cleared it & marked it with pieces of a plastic bag. 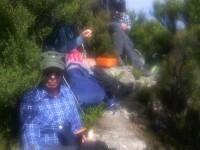 Lunch at 1.00 p.m. in the sun sheltered from the wind. 2. 9/4/2011. Mountain Road, Green Hill. Rosella Ridge, Mountain Road. 13 km. 5 hours. Ken and Dermot parked their car near the locked gate on Mountain Road and walked back to the the Green Hill track entrance. 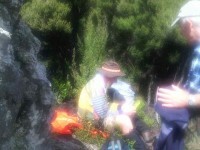 They encountered several Saturday walkers on the track to the Green Hut site. They found the steep climb above it onto the ridge even muddier than ever. 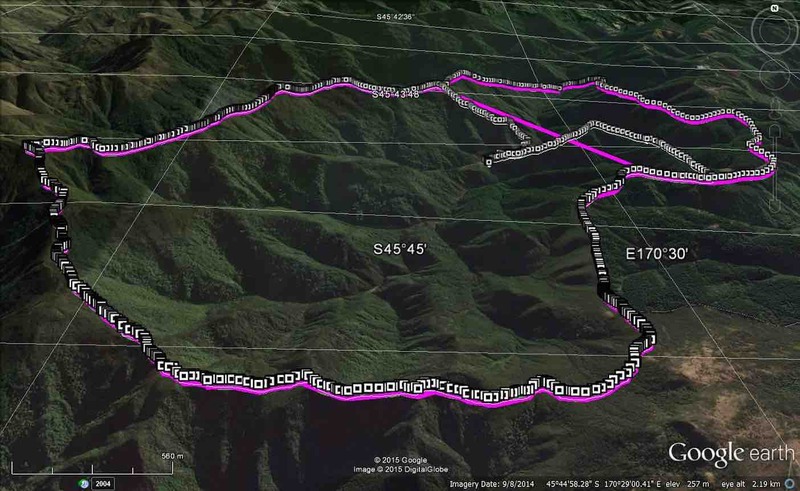 GPS of Rosella Ridge, courtesy Ken. Mountain Road is the largely straight route on right of pic. Sharp point upper left is where Rosella Ridge track turns off from Pulpit Rock track. 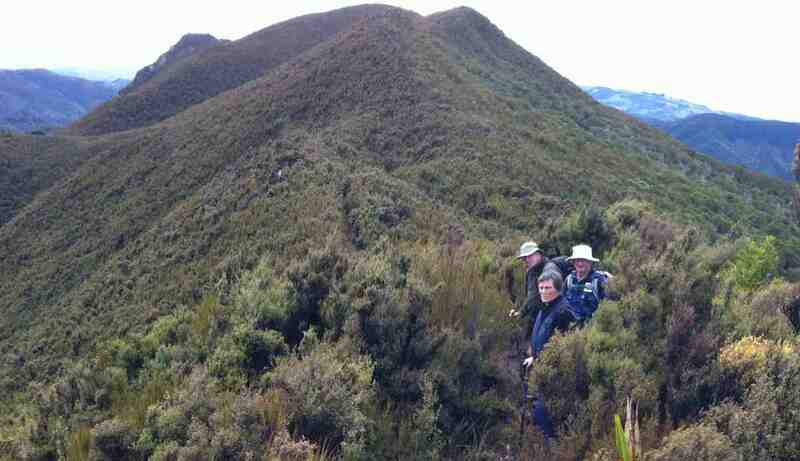 Sharp double-back near middle indicates crossing of South Waikouaiti Stream. 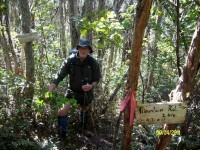 The turn-off to Rosella Ridge is marked by a DoC sign advising not to proceed beyond this point!! Seems its purpose can only be to keep things simple for visiting trampers heading for Jubilee Hut. 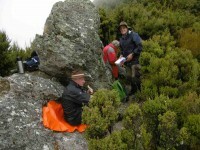 Admittedly, a bit of local knowledge helps when planning to use the Rosella Track. It appears from the following pic that Rosella Ridge has its own ups and downs to negotiate. 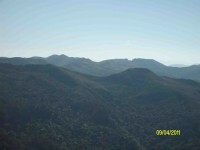 This point on the GPS route photo is the top right “A” bend. 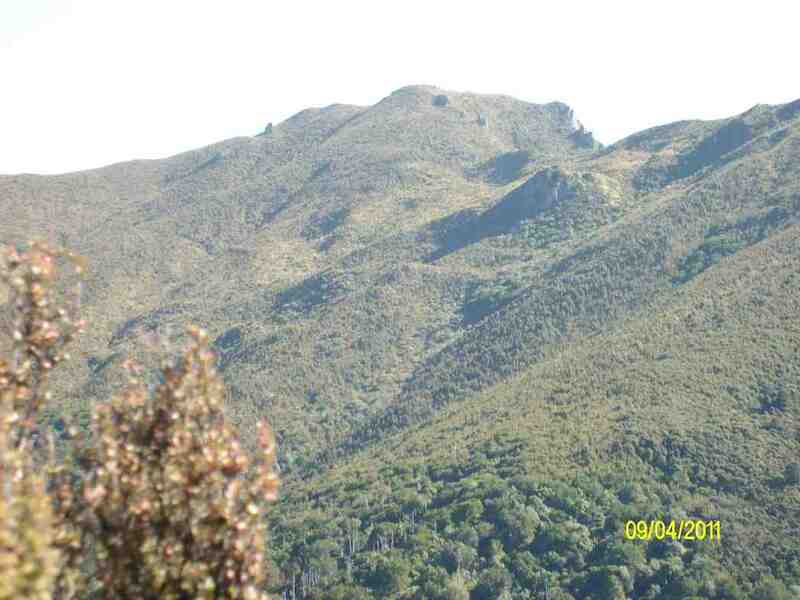 Walkers Track disappears up off the top of the pic and reappears coming off down a ridge to the right. 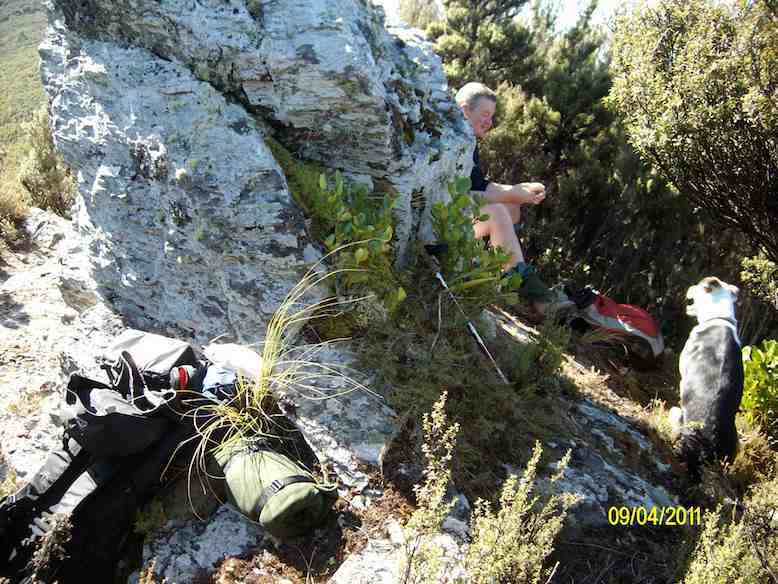 Ken and Dermot descended the Hunters Track to cross the Waikouaiti South Branch and climb up to Mountain Road and return to the car. Are you fit enough yet Dee ? ?